One of the most significant and iconic figures in American popular music in the 20th Century Hank Williams became a legend when he died aged just 29 in the back of a Cadillac in Oak Hill, West Virginia where his manager was taking him to a concert show and had to pull over during an ice-storm. Williams’s reputation has increased exponentially as his posthumous released recordings are always available. He actually only made two studio albums proper in his own brief lifetime. Emerging before the arrival of mass-marketed long players (this was still the age of 78rpm shellac, rather than the revolutionary vinyl) Hank was a successful singles artist and a country music pioneer who was known as The Hillbilly Shakespeare, also Luke the Drifter and The Singing Kid. His best-known songs are such classics that grown folks still weep at the very mention of “Your Cheatin’ Heart”, “Hey, Good Lookin’” and the transcendental “I’m So Lonesome I Could Cry”, a song many believe to be the apogee of the country genre. A colourful character in his lifetime Williams was no saint but his drink and drugs intake was partly explained by a ferocious on the road lifestyle that entailed long car journeys from gig to gig, interspersed with cheap motels and a hell-bent desire to perform his work. One of the great stars who emerged just before the Rock and Roll era if he’d lived there seems little doubt that Williams would have transcended the limitations of a world typified by the Louisiana Hayride radio show and the Grand Ole Opry’s ultra-conservative dictates. That didn’t happen for him but he is part of a lineage that runs from the old blues of the Deep South through to Roy Acuff and Ernest Tubb and the whole Singing Cowboy movement. The bittersweet romance of his passing gave him otherworldly qualities: his songs and his image have been appropriated with the relevant reverence by so many…. Waylon Jennings, Leon Russell, Gram Parsons, Asleep at the Wheel, Ry Cooder, the Rolling Stones, (Keith Richards is a huge fan), Buzz Cason, Kris Kristofferson, Alan Jackson, Neil Young (who owns Hank’s old D-28 Martin Guitar) and many, many others. He is the subject of countless tribute songs and albums and the posthumous recipient of too many awards to list here. His lineage is continued by his son and his grandson who are proud to keep the name and the flame alive. 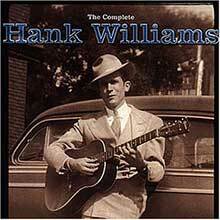 But there is only one Hank Williams. Born Hiram King Williams in the sleepy environs of Butler County, Alabama in 1923 the young man seemed destined to follow a musical path once he was given his first guitar. Obsessed with gospel, blues, folk and country (and Western) honky-tonk Williams was often spotted wearing spectacles and busking on the streets of Montgomery. His first proper outfit was dubbed the Drifting Cowboys and they hit the road with a vengeance while Hank hit the bottle as a teenager. His idol and mentor Roy Acuff once ticked him off: “You’ve got a million-dollar talent, son, but a ten-cent brain.” The businessman and country mogul Fred Rose brought him into his stable and soon the publishing deals flowed, as did tours and radio show slots. When he made his debut at the Grand Ole Opry he dumbfounded the venue’s owners by becoming the first artist to be called back for six encores, and he’d only played three songs in his allowed set! As was the norm then Hank concentrated on singles that were sent out to southern DJs. The hits flowed. He’d already covered and smashed with “Lovesick Blues” in 1949, a #1 that made him a household name and he developed an important body of work thereafter. Around this time Williams released more hit songs, such as "My Son Calls Another Man Daddy", "They'll Never Take Her Love from Me", "Why Should We Try Anymore", "Nobody's Lonesome for Me", "Long Gone Lonesome Blues", "Why Don't You Love Me", "Moanin' the Blues", and "I Just Don't Like This Kind of Living". In 1951 "Dear John" became a hit, but it was the flip side, "Cold, Cold Heart", that became one of his most-recognised songs. A pop cover version by Tony Bennett released the same year stayed on the charts for 27 weeks, peaking at number one. In 1952 he kept the brilliant tunes coming: in June alone he recorded "Jambalaya," "Window Shopping," "Settin' the Woods on Fire," and "I'll Never Get out of this World Alive." His last recording sessions in September then yielded "Kaw-Liga," along with "Your Cheatin' Heart," "Take These Chains from My Heart," and "I Could Never be Ashamed of You." Unfortunately his alcoholism ran counterpoint to his fame and Roy Acuff and Fred Rose regretfully terminated their association with the troubled singer who was now in thrall to various prescription drugs, including amphetamines and morphine. But what cannot be denied is that while he did himself no physical favours Williams was not just a victim of life’s circumstances and if he was partly the architect of his own downfall it was his personality and character that informed the bruised brilliance of his work. As for the albums please consider these for discovery: Hank Williams Sings (1951) produced by Fred Rose, is 22 minutes of genius that includes Leon Payne’s “Lost Highway”, his own “I Saw the Light” and the spooked “Six More Miles (To the Graveyard)” as well as the jaw dropping “Mansion on the Hill” (one of his many religious or metaphysical musings) and “A House Without Love” as well as the gospel tinged “Wealth Won’t Save Your Soul”. 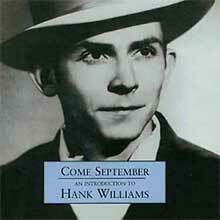 While these were essentially B-sides they introduced Hank to an audience beyond the jukebox country market. Moanin’ The Blues (1952) was also a revisit to older material but since that included “I’m So Lonesome I Could Cry” and "The Blues Come Around” plus several bona fide hits they still sound new to us. At a time when the 10 inch LP or the 78 version was far more universal than the new-fangled 12 inch album (few even had the equipment to play such a thing) it was a given that album sales were less paramount than the ticking over drip feed of the single format. In any case Hank died on New Year’s Day, 1953, going the way of a hillbilly in a smart car en route to a concert at Charleston’s Municipal Auditorium. It was a sad and somewhat tawdry demise but the man’s true legend then unfolded as listeners discovered him and obsessed over his atmospheric songs and amazing vocal delivery. Various live and posthumous packages have surfaced since. 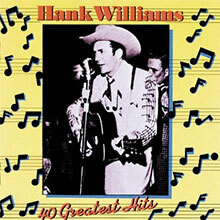 The best ones include The Very Best of Hank Williams (1963) that went Platinum a decade after his death, also 40 Greatest Hits and The Complete Hank Williams. In 2011 came Icon: Hank Williams (all the above via Mercury). Because of his legacy and his talent Hank’s star hasn’t faded. Anyone with an interest in country, blues and folk will surely find plenty to enjoy here and new generations are lucky enough to be able to discover this extraordinary figure all over again. Are you sure Hank done it this way….? Waylon Jennings once asked during the height of the Outlaw movement. Find out for yourself, exactly how Hank did it his way. 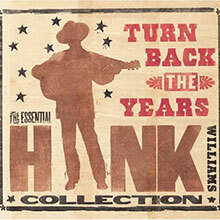 There have been countless Hank Williams compilations issued over the years, ranging from cheap budget-line discs to box sets of his complete recordings, but the idea for the triple-disc 2005 set Turn Back the Years: The Essential Hank Williams Collection is a fresh one: instead of following the traditional chronological approach, or mixing up his greatest hits in random order, this borrows a cue from Columbia/Legacy's 2000 set Love, God, Murder and arranges Hank's work thematically. Each of the three discs is titled after one of his songs, each bearing a clear thematic imprint: the first is "Honky Tonkin'," and contains his barroom anthems; the second is "Cold, Cold Heart" and has his high, lonesome heartbreak songs; the third is "I Saw the Light" and is devoted to gospel and religious tunes. This is an effective way to present his catalog, since each of the discs plays as a cohesive album and, taken together, they give a good indication of the range and depth of Williams' music. That said, this shouldn't be seen as a definitive collection, containing all of his great songs -- indeed, such classics as "You're Gonna Change (Or I'm Gonna Leave)," "Mind Your Own Business," "My Bucket's Got a Hole in It," "I Can't Help It (If I'm Still in Love with You)," "Half as Much," "Jambalaya (On the Bayou)," "I'll Never Get out of This World Alive," and "Why Don't You Love Me (Like You Used to Do)" are all absent. But that's the curse of a catalog as rich as Hank Williams' -- there's no way that one collection can contain all of his great songs. Turn Back the Years doesn't, but it does offer a different way of looking at his catalog that functions both as a thoroughly enjoyable listen for longtime fans and as an excellent introduction for neophytes who want thematic, cohesive albums instead of the usual greatest hits. Hank Williams' body of work is so large and has been repackaged so many times in so many forms that the notion of creating a definitive compilation almost seems like an impossible goal. However, as a one-stop shopping place for Hank's basic repertoire, 40 Greatest Hits is as good as it gets. While it doesn't include everything, practically every memorable hit is here, and thankfully every cut appears in its original form (that means in mono, with no string overdubs or artificial duets with his family members). The track sequence subtly reflects the arc of Williams' short but vitally important career, and there's enough good music and great songs here to make a fan of anyone with even a passing interest in American music. If you care about country music, you need some Hank Williams in your collection, and there isn't a better introduction to his rich body of work on the market than 40 Greatest Hits; begin here, then start exploring. 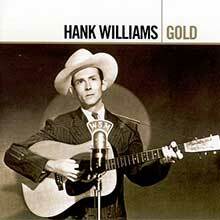 Hank Williams is where modern country began. His brilliant songwriting, stage sense, and unassuming vocal delivery, although it's hard to imagine it now, made him the template for everything that followed in his wake. This archival set includes the only two actual concerts ever recorded of Williams, both from 1952, the last year of his life, and they feature a more relaxed and less scripted Williams than the "live" recordings he frequently made for radio shows. Taping concerts was a rare thing in 1952, mainly because the technology to do it was still in its infancy, and these historic shows were only preserved by the grace of God and the winds of fate. The sound is sketchy in spots, and nothing performed adds anything distinctive to Williams' legacy, but the fact that these concerts were actually captured (one in Niagara Falls and one in Sunset Park) is what makes them special. Also included here is a radio interview Williams did with Mack Sanders in 1951 for KFBI in Wichita, Kansas. Tall, charismatic, and eschewing rustic hillbilly stage outfits in favor of sleek, tailored Nudie suits, Hank Williams was country music's first true superstar, and he was more than aware that a little motion on-stage drove the ladies crazy. But it is Williams' songwriting that has ensured his legacy more than anything, and his songs -- which mixed hillbilly elements with blues and gospel, all with a firm grasp of how to shade in some Tin Pan Alley techniques -- crossed over regularly to the pop charts, and have continued to hold up well even into the 21st century. Songs like "I'm So Lonesome I Could Cry," which has a spare, poetic structure so efficient it could be a haiku, and "I'll Never Get out of This World Alive," which manages to be funny, ironic, and prophetically frightening all at once, don't happen by accident, and show an awareness of craft that has a good deal more in common with Irving Berlin than it does Uncle Dave Macon. 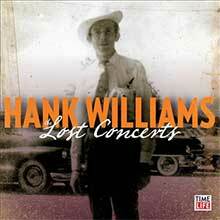 This two-disc overview of Williams' career includes his classic MGM and Polydor singles from 1947 to 1952, a handful of haunting acoustic demos (which show him to be a quite capable acoustic guitarist), a couple of his Luke the Drifter cuts, and a half-dozen or so live spots from the Grand Ole Opry (in 1950) and Health & Happiness (in 1949) radio shows. Thankfully it includes none of the string-sweetened overdubbed versions that proliferated after Williams' death, and given the number of dubious and rather thrown-together Hank Williams collections on the market, Gold earns trust points for being both thorough and tasteful. Eschewing hillbilly stage outfits in favor of sleek, tailored Nudie suits, Hank Williams was country music's first true superstar, and he was more than aware that a little motion on-stage drove the ladies crazy. But it is Williams' songwriting that has ensured his legacy more than anything, and his songs -- which mixed hillbilly elements with blues and gospel, all with a firm grasp of how to shade in some Tin Pan Alley techniques -- crossed over regularly to the pop charts, and have continued to hold up well even into the 21st century. Songs like "I'm So Lonesome I Could Cry," which has a spare, poetic structure so efficient it could be a haiku, and "I'll Never Get Out of This World Alive," which manages to be funny, ironic, and prophetically frightening all at once, don't happen by accident, and show an awareness of craft that has a good deal more in common with Irving Berlin than it does Uncle Dave Macon. Both of these songs are collected here, but some of Williams' best-known songs like "Jambalaya" and "Your Cheatin' Heart," to name just two, are not, so while this little anthology is fine as far as it goes, it might not be, in spite of its title, the best introduction to Williams. It'll do, but there are better packages out there.